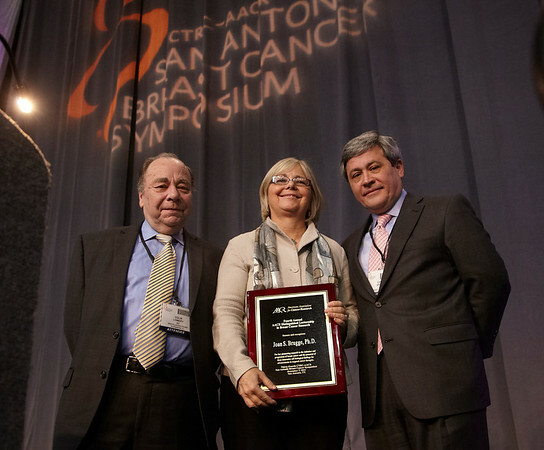 San Antonio, TX - SABCS 2011 San Antonio Breast Cancer Symposium: Joan S. Brugge, PhD presents Aacr Distinguished Lectureship In Breast Cancer Research during the GENERAL SESSION 1 at the 2011 San Antonio Breast Cancer Symposium here today, Wednesday December 7, 2011. Over 9,000 physicians, researchers, patient advocates and healthcare professionals from over 90 countries attended the meeting which features the latest research on breast cancer treatment and prevention. Date: Wednesday December 7, 2011 Photo by © SABCS/Todd Buchanan 2011 Technical Questions: todd@medmeetingimages.com; Phone: 612-226-5154.